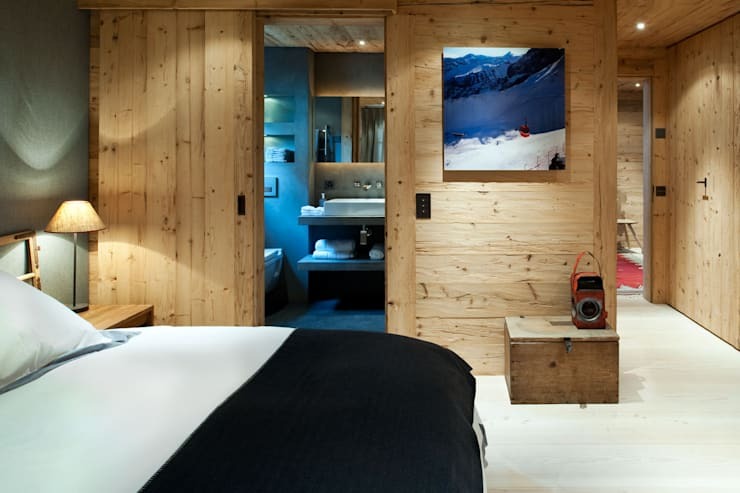 Rendered with beautiful natural materials and simple and clean lines, this chalet in Gstaad, Switzerland, is a stylish and cosy getaway for tired city souls. 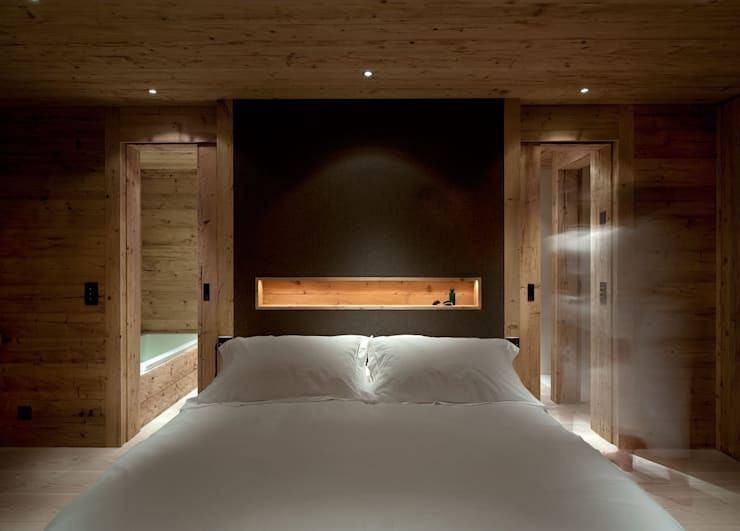 Spanning an area of 380 square metres, this modern and luxurious home uses Austrian timber for the walls, Danish planks for the floors, and Turkish limestone in the bathrooms. 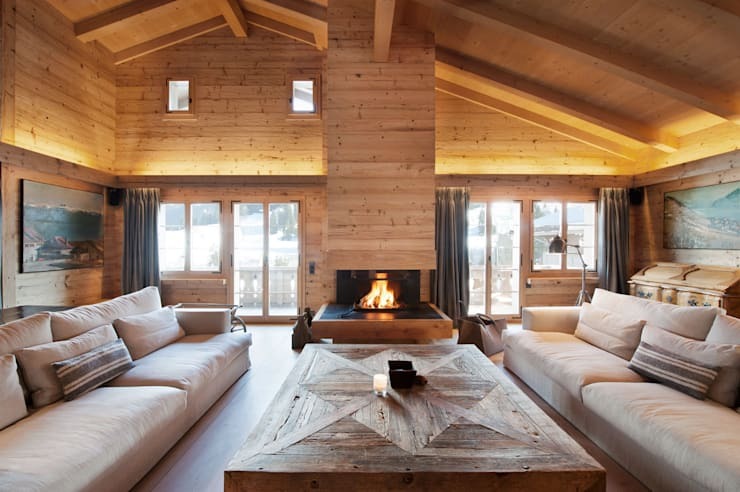 The colour palette is neutral, soothing and elegant, with white, grey, and wooden hues ruling the interiors. 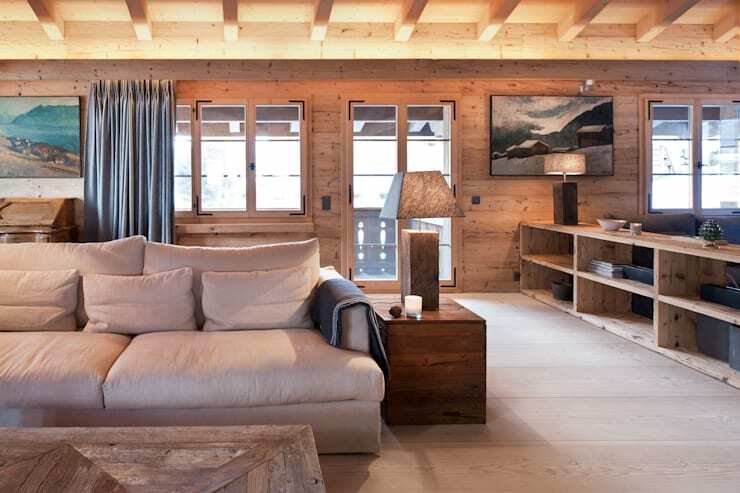 A tasteful mix of contemporary and antique furniture, metallic lighting fixtures, and cosy fabrics like wool and cashmere ensure that the living experience is truly comfortable. The basement and ground floor comprises of five bedrooms and bathrooms, while the top floor is devoted to entertaining guests and relaxation. 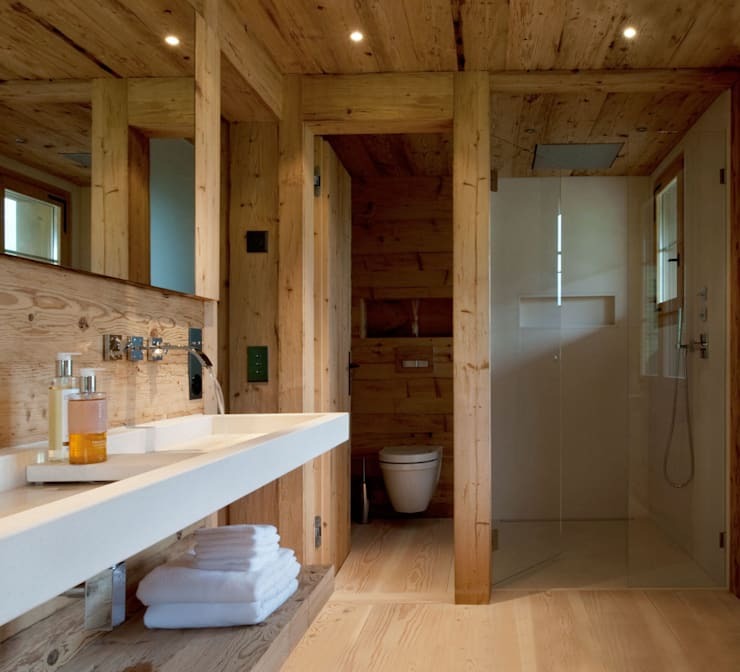 Credit for creating this refreshing and eco-friendly sanctuary goes to the interior architects at Ardesia Design. 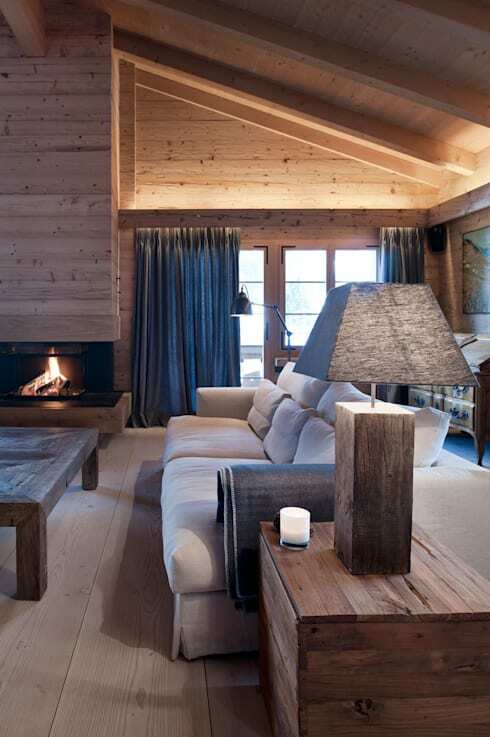 A light-hued wooden environment, trendy and plush sofas and an elegant fireplace lined with slate make this living area homely yet gorgeous. Large glass doors and windows bring in oodles of sunlight, while the vintage style coffee table and cove lighting complete the look here. The scenic paintings add a bit of colour to the rustic walls, while modern lamps and simple side tables enhance the contemporary feel here. The long open shelf separating the living area from the rest of the home is stylish and very useful. Glass and gleaming steel come together to create a sleek and ultramodern wine cellar in the basement. 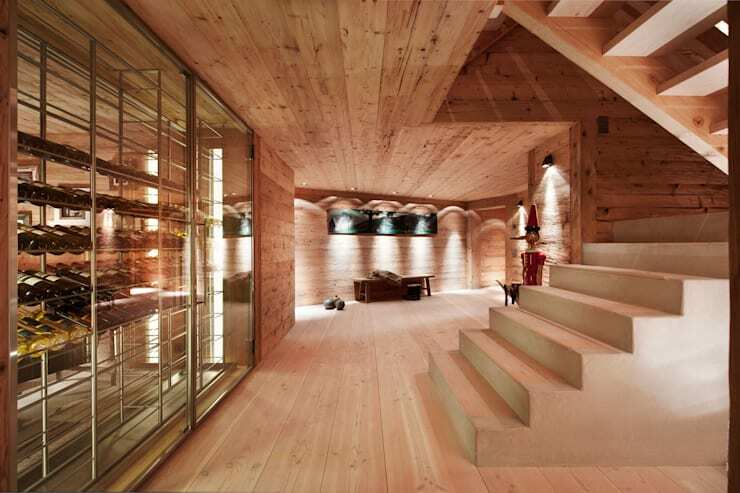 It adds a trendy touch to the wooden environment, while neat steps lead you upstairs. The dining arrangement is an ultramodern one with a large square table surrounded by minimalist chairs. A contemporary lamp hangs on steel cables over the setting, while a bunch of flowers lends freshness. Gleaming chrome appliances add a dash of industrial chic to the warm and inviting kitchen. 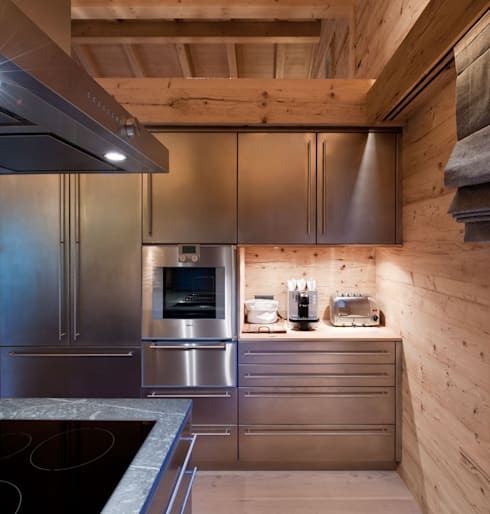 Wood and steel combine for a fashionable and soothing look. 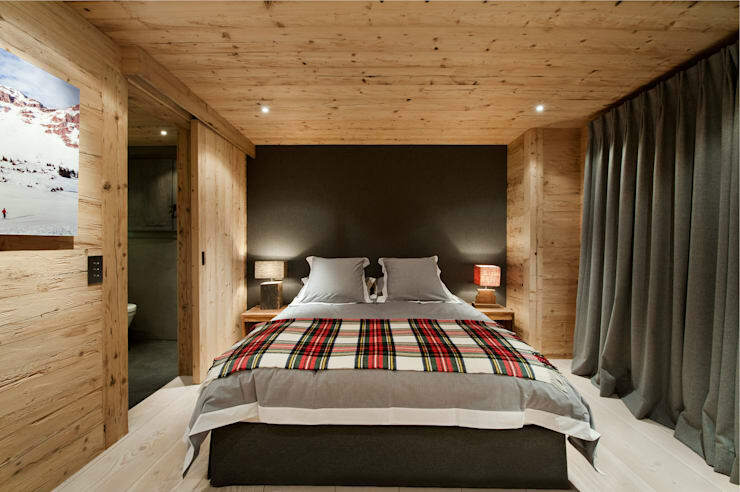 Bright plaid cushions and curtains add pizzazz to this white, grey and wooden bedroom. Softly glowing red lamps on neat side tables contribute to the romantic ambiance. 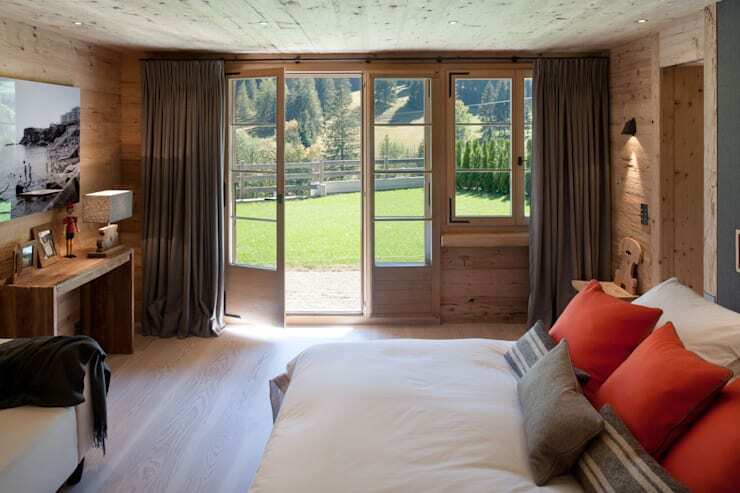 This bedroom offers a stunning view of lush green mountains and towering conifers. Sunlight floods the space through the latticed glass windows, while bold red cushions add colour to this neutral room. The unique yet classic mix of black, grey and wooden tones makes this bedroom a bold space full of personality. 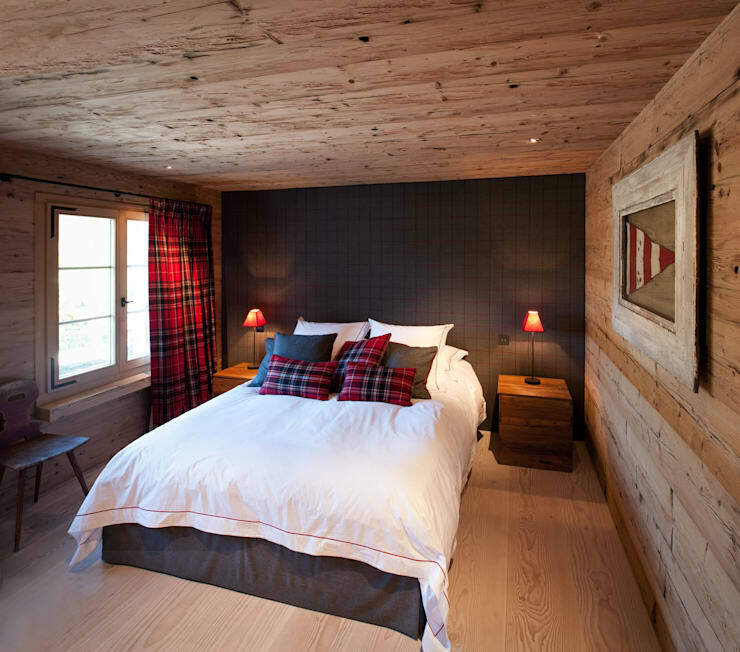 A bright plaid throw adds colour to the plush bedding, while quaint lamps make for a soothing ambiance. 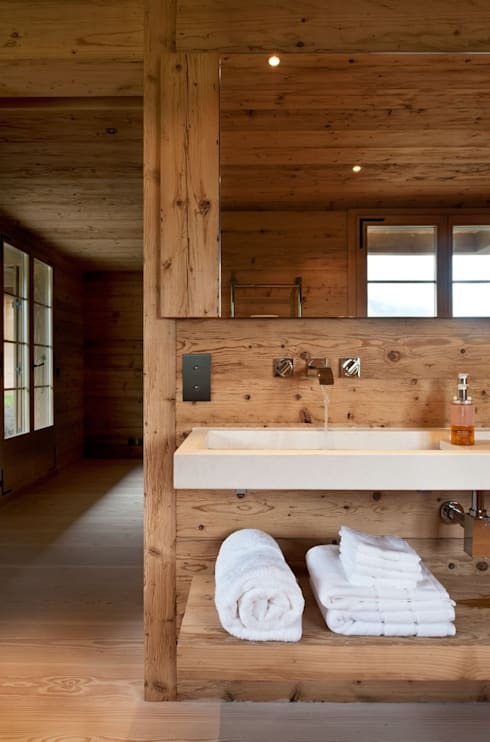 Wood combines with modern materials like glass shower panels, white sanitary wares, and steel fixtures for a look that is rustic yet contemporary. 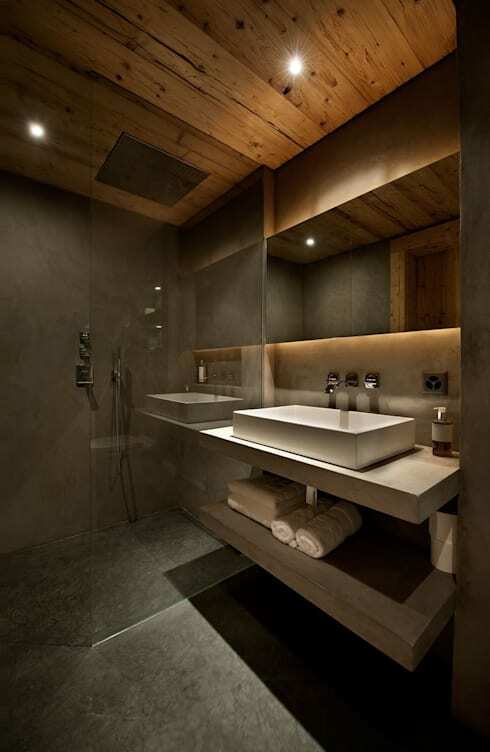 A large mirror and recessed lights add brightness and cosiness here. 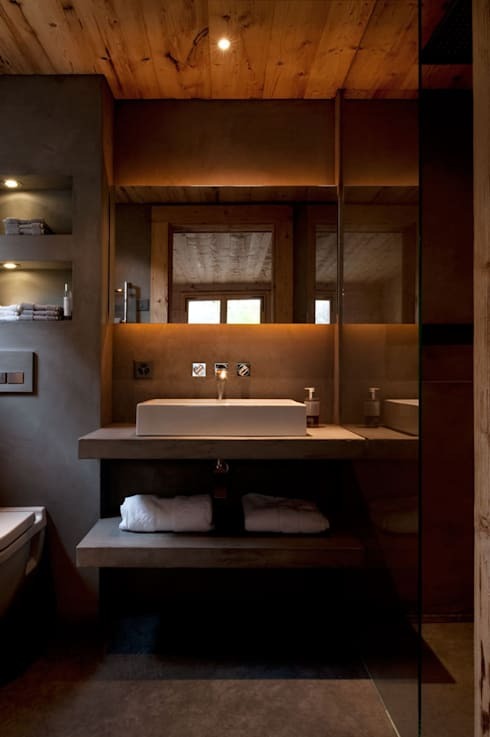 Just like the previous one, this bathroom too is a mix of modern and rustic. A backlit mirror makes for a glamorous touch, while a wooden shelf under the sink offers storage room. Need more inspiration? Here’s a tour you might enjoy - This stunning home will drive you nuts.